By now, you have learned many of the pieces of our solution. We can now start to assemble what we have learned into a functional system which promotes prosperity, sustainability, harmony, gender balance, and stability. This section will help you understand why we chose the pieces that we did. We propose that we stabilize the international currency system by adding some new species of currency into the ecosystem. Up to now, we have been defining the requirements for a GGCurrency system, along with affiliated currency species. Let us now see how we might be able to meet those needs. For this discussion, the word “Shares” is used as the unit of the currency, much as shares of a credit union or shares of the ownership of a stock. Only by balancing the Yin and Yang, the male and female, the commercial capital and the community capital will we gain true abundance in our lives and in our communities. As economists from Keynes to the Chinese People’s Bank today have said, a good backing for a national or international currency includes a basket of currencies, precious metals, and commodities. To which, we would suggest adding real property, energy, and shares of GGTrust, which span most industries and reach into the future. GGTrust shares could be issued as paper share certificates, which would be similar in appearance to a share of the GGCurrency, and could be traded similarly. This is discussed in detail in the GGCurrency Proposal. Fiat national money is created by banks placing loan “money” into borrowers’ bank accounts. Increasing money means an increase of debt. This increases the scarcity of the system. GGCurrency will be increased by increasing the assets, or by performing labor for credit. This increases the abundance of the community. We suggest creating the new money in a variety of interchangeable forms to meet the various requirements of local and international commerce. These will include a digital form, like the dollars in your bank account. We expect that for the present, most participants in the local economies will be comfortable using paper notes (scrip) with which they are already familiar. These should be authenticated with an anti-counterfeiting holographic tamper-resistant sticker. It is likely that these will exist as, or be convertible into, a cryptocurrency form, so that they will be able to be transferred globally without relying on the BIS/IMF/Federal Reserve/SWIFT/BRICS system. It is also possible that units of account in a local Mutual Credit currency system may not need to be cryptocurrencies, but they could be as well. We expect that for the present, most participants in the local economies will be comfortable using paper notes (scrip) which they are familiar with. These should be authenticated with an anti-counterfeiting holographic tamper-resistant sticker. We have explored the possibility of giving some of the international notes an intrinsic value by incorporating precious metal fibers within the notes. Some of these may contain precious metals in the form of fibers, or even a layer of pure metal sandwiched between layers of polyester, such as the Aurum. This would blend the yang/hard money characteristics with the yin/local currency aspects. The purpose of incorporating precious metals into paper currency is not to provide an equal value in metal to the value of the currency, but more to give at least some intrinsic value to the notes. This, in turn, may give some assurance that there is, indeed, value backing this currency. These notes may also become collectors’ items, and be removed from circulation (typical of a yang currency). If we put, as an example, $20 of gold in a $50 note, which is then removed from circulation by the owner, we then have backed $50 of currency with only $20 of gold, and it is unlikely to be redeemed. That gives us $30 in extra working capital. As discussed in GGCurrency Proposal, “Certificates of Beneficial Interest” and “Certificates of Financial Interest” will serve as recognized GGTrust share certificates, but will be exchangeable with other GGCurrencies. Some may come in bearer share form, readily transferrable, and others will be registered to the owner and records kept at Trust headquarters. Local currencies are most likely going to be notes, usually called “scrip”. These are easy to produce and transport, and can be affixed with a security seal to help authenticate them. Most of these will be printed by commercial printers with an anti-counterfeiting holographic tamper-resistant sticker. We may also produce local coins which may contain precious metals as well, or may not. All of these currencies can be designed with images and symbols from the local area, to make them more attractive and to increase the use by local residents. In addition, we may have special artisanal coins and notes, which are valued for their artistic or numismatic value as much as their denomination. These can be original, signed artworks, or limited run prints, and sales of these notes and coins can be an income stream for the local economy. Artisanal coins activate the Lover archetype with their beauty. Holographic stickers could be affixed or incorporated into these coins as well. Fungibility means that each unit of currency has the same value. Certainly we understand that each dollar, whether folding paper in your pocket, dollar coins, or digital dollars in your bank account, has the same value. But historically, not all dollars are the same. Gold dollar coins were always the standard, and paper currency was valued because it could be redeemed in actual gold coins. US Treasury silver certificates were not quite as good, but they could be redeemed in silver dollars. Today’s Federal Reserve Notes (FRNs) cannot be redeemed for anything, and have lost 97% of their value in the 100 years since the first one was printed. While all the types of GGCurrency are fungible and interchangeable, this does not mean that they are equal. Each type has specific qualities which may not be found in another type. For example, historically a silver or gold certificate US Dollar could be exchanged for its equivalent in metal coins, a characteristic which was not present in other notes of equivalent monetary value. Similarly, a share of GGT includes certain rights and expectations which are not found in a local note. And a share of a mining stock may include such things as voting rights in that company, or dividends, which are not found in a share of GGT. Figure 2 and table 1 below give more examples of different kinds of GGCurrency used for different purposes, and this is discussed further below. Of the cryptocurrency attributes discussed in the Currency Proposal, we intend to include some of them in our currency solution. These will include the ability to cheaply, easily and securely transmit our currency electronically, the ability to do some conditional transactions, and possibly, the creation of shares by “mining” as in Bitcoin (through proof of work of mathematical problems, as in Bitcoin). Most cryptocurrencies in use today are merely means for speculation, for the creator to make large amounts of money by creating the currency and watching its value rise, then selling off his shares. Our currency will be stable, backed by assets, so it will not be a mechanism of speculation. The new computer language called Ethereum was created especially for the creation of cryptocurrencies. We intend to use Ethereum to write the code for our currency. This will also allow us to incorporate special features such as escrow functions, conditional transfers, transfer of assets to multiple parties, transfer of properties, contracts as computer information structures, and many other exciting possibilities. F. Create a Yin type of currency similar in function and form to the Terra Trade Reference Currency. The Terra may be the best choice for an international Trade Reference Currency to balance the Yang currency characteristics at the international level. 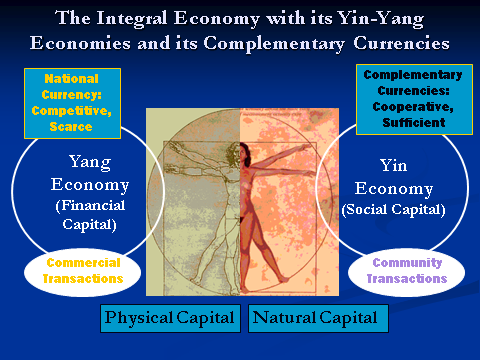 The local currencies are also yin type currencies, and have much more effect at the local level. Demurrage, or negative interest, is a disincentive to hording money, and an incentive to spend it. It may be thought of as the incentive in the childhood game to get rid of the hot potato before the timer rings (demurrage payment is due). As the hot potato stimulates circulation, demurrage has been shown to significantly increase the amount of circulating currency in an economy, and thus increase the wealth and prosperity of that society. Demurrage is a penalty on holding cash: typically 3 – 12% per year. A demurrage will facilitate a massive increase in velocity of circulation. The famous Wörgl experiment saw its currency circulate up to 130 times during the 13 months it was in operation. As that currency circulates 13 times as much within the community, it is in effect 13 times as much money in the community! The effective wealth in the community therefore increases by a factor of ten. Thus, by the use of demurrage, it may be possible to increase the wealth of the community by more than TEN TIMES the original amount, just by using this small usage fee! Demurrage is used in the Terra TRC to counter the effect of business cycles. But business cycles may be less problematic at the local economy level. If the currency we are proposing is to serve as an alternative to both the Euro/dollar/yang-type national currencies, as well as the functioning at the local level, then it may be wise to have an interest-bearing form of the currency as well. There is definitely a movement against interest, both in Islamic Sharia law and in fundamentalist Christian and Jewish banking. So, if an interest-generating function was desired, this could be fulfilled either by the national currency/international currencies, or by a particular form of GGCurrency. As suggested by Migchels, discounting the conversion of national currency into local currency is a way to encourage entry into the local currency system. Once the value is circulating in that system, an exchange fee will discourage removal of that value from the local economy. 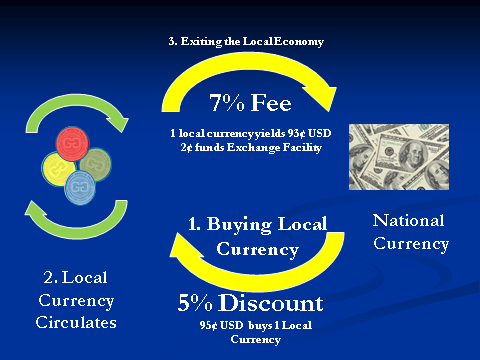 Part of the fee can be used to fund the local exchange facility, or to provide labor-based money. This is discussed at some length in the Implementation Section, but here is an illustration of how it might work. Exit fees encourage value staying in the local economy, while discounts for entering the local economy encourage participation from national currency sources. Balancing the strong Yin/feminine aspects of the local currency will be the yang characteristics of the Magician archetype providing cryptological protection characteristics to the currency, and the Warrior archetype activated by legal and protective aspects of the currency. Thus, the digital and cryptologic protection aspects balance the beautiful and abundant aspects of the system. 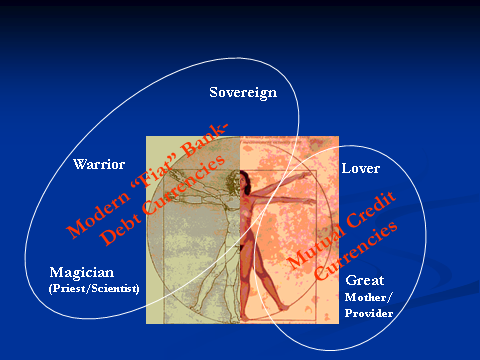 By activating the Lover and Great Mother/Provider archetypes, using the complementary currencies along with national fiat currencies gives a balanced money system.